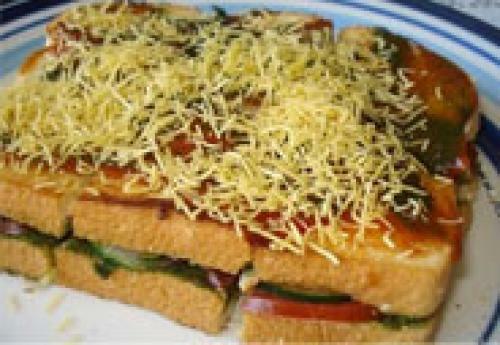 Bombay sandwich is very easy to make snack. grilled bombay sandwich is made from white bread smeared with green chutney and butter and then stuffed with thinly sliced tomatoes, onions rings, cucumber and potatoes and grilled on both sides. for the green chutney- grind together green chillies, mint leaves, coriander leaves, salt and lemon juice to a smooth paste. trim off the edges of each slice of bread, apply 1 tsp of butter and 1/2 tsp of green chutney on each and keep aside. place the slice of bread, with the buttered slide facing up , on a clean flat surface. arrange few cucumber pieces over it and sprinkle 1/4 tsp of chat masala over it. arrange two slice of onion, 2 slice of potato and 2 slices of tomatoes over it. sprinkle salt and red chili powder over it and again evenly sprinkle chat masala over it. place the other slice of bread with the buttered side facing downward. cut into four equal parts and on top sprinkle 0 size sev over it. or if you want you can even toast or grill them in a griller with butter smeared on both sides and then sprinkle some 0 size sev on it.